They say familiarity breeds contempt… and, in the case of the chaffinch that’s probably true. The male chaffinch in its full breeding regalia is one of our most colourful and striking birds. If it wasn’t for the fact that we see them so often we’d marvel at these colourful little finches. 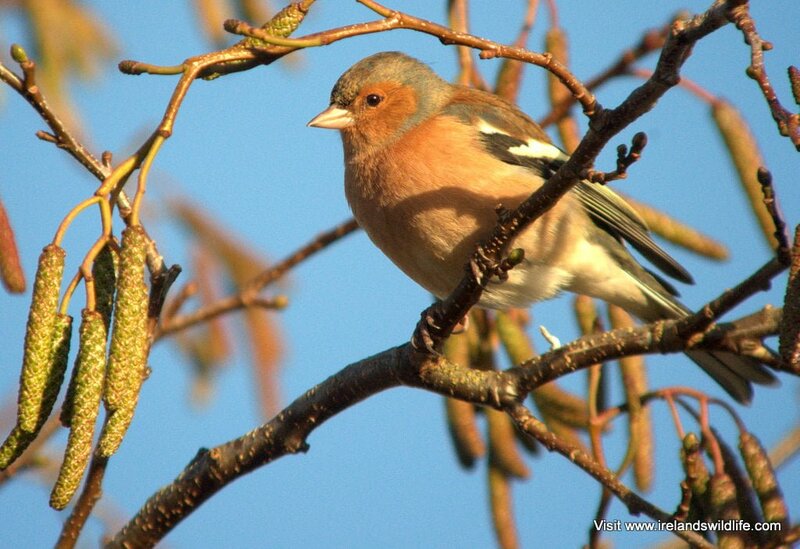 The chaffinch is found all over Ireland in woodlands, parks, gardens, fields, scrub and hedgerows. It is only absent from high upland areas. Chaffinches are common visitors to gardens, especially in the winter, when pickings from garden bird tables supplement their natural food, which tends to be in short supply. Adult chaffinches are sparrow-sized birds from 14cm – 18cm (5.5 – 7 inches) long, with a wingspan of 24.5cm – 28.5cm (9.7 – 11.2 inches) and weighing between 18g and 29g (0.6 and 1 ounce). Male birds are very distinctive, with a rosy pink-red breast and cheek patches, bluish grey crown and nape, white shoulder patches and black wings. Although these colours are more subdued in winter the male chaffinch is always an easy bird to identify. Females and juvenile birds are drab compared to the males. They have greyish-green backs and buff-grey breasts but share the male’s distinctive white shoulder patch. All chaffinches are easily identified in flight when they reveal double white flashes on the wings and white sides to the tail. Like other finches their flight is undulating, with the bird bobbing up and down as it travels. Chaffinches produce a wide variety of calls, including a loud clear “Pink” sound when perched. They also have a loud rattling song that is a familiar sound in our parks and gardens. Interestingly chaffinch songs are very variable, with individuals from different regions using their own particular variation – rather like human accents and dialects. The song remains broadly similar, however, and is easily identifiable as that of the chaffinch. At the start of the spring breeding season the male, resplendent in his breeding plumage, performs a courtship display aimed at impressing the female. After mating the female builds a small, neat nest typically in the fork of a tree or bush close to the main trunk. The nest is lined with soft moss, lichen and feathers, and in it she lays 4-5 pale blue eggs with red blotches. She incubates them for the next 11-14 days. Young chaffinches are fully fledged 13-14 days after hatching. Unlike other finches chaffinches only rear a single brood each year. Chaffinches feed on seeds, particularly of cereals and weeds, and have a bill well adapted to de-husking them. They are most at home feeding on the ground, and can often be seen patrolling beneath bird tables and feeders picking at the spoils dropped by messy feeders above. During the breeding season they also take insect larvae and adult insects, which are an invaluable source of protein for their growing young. In winter some migration occurs. Females tend to migrate further than males, a phenomenon that lead to the bird’s scientific name coelebs, which means bachelor. In northern Europe, particularly Scandinavia, the only chaffinches seen in winter are “bachelor” males. Conversely here in Ireland the ranks of our resident chaffinches are swelled by migrating females from further north, and we’re likely to see far more female birds than males. Chaffinches are not currently of conservation concern, and estimates put the Irish population at over 2 million breeding pairs, with a further 5.4 million pairs in Britain. The European population is estimated at between 80 million and 96 million breeding pairs.